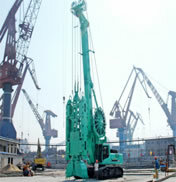 Work site: Expo construction site in area of Shanghai Jiangnan Shipyard Co.,Ltd. 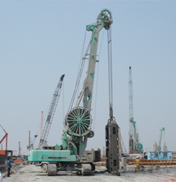 Work site: Transportation hub --Shanghai Hongqiao Airport Construction enterprise: Shanghai Tianyu Co., Ltd.
Construction enterprise:Vietnam Pacific Co., Ltd.
Subsoil conditions:Sand bed，Stiff hardpan. 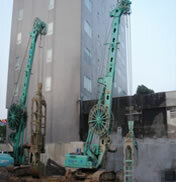 The hydraulic diaphragm wall grabs make the wall depth of 6m for 20 hours with the verticality above 3/1000. 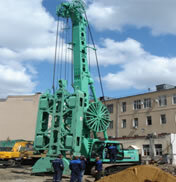 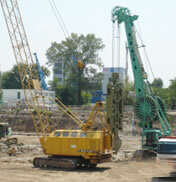 The Square shaft was finished within 26 hours.